The fourth annual CSWS Northwest Women Writers Symposium will be held May 7-9, 2015, and if you’re interested in food (which I assume you are, given your choice of reading material) and free talks, you’ll be happy to know we’re welcoming back to Eugene the enchanting keynote author, Diana Abu-Jaber. She’ll be presenting and empanelled with urban farmer extraordinaire Novella Carpenter and Sista Vegan Project’s founder Dr. Breeze Harper. My students and I have just finished reading Carpenter’s Farm City in my New Farmer’s Movement class (COLT 305), so I’m excited to chat with her at a public conversation on May 8 at 1 p.m. and see slides of the farm and all her work. For more details about the many events of the Symposium, click the link above. I’d also like to encourage you to snap up the last few slots for the free, open to all, writing workshops being offered through the Symposium. Two are still open, including mine, and both seek to diversify food writing by using very different approaches. 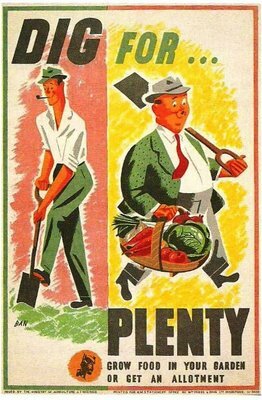 I’d love to have you join us, especially if your own perspective is lacking in today’s food media. Descriptions below. Workshops take place on May 9, from 1:30 – 3:30 p.m. at the downtown Eugene Public Library at 10th and Olive (100 W. 10th St.). To reserve a slot, call the Eugene Public Library ASAP at 541-682-5450 (Press 2). 1) “Food beyond Foodie: Strengthening and Diversifying Food Writing for Publishing,” taught by Prof. Jennifer Burns Bright, columnist at Eugene Magazine and sole proprietor of the award-winning blog, Culinaria Eugenius. She moonlights as a travel and food writer while teaching literature and food studies at the University of Oregon, writing about anything from Dutch pickles for NPR to Russian dumplings for AAA’s Via magazine. Workshop Description: Blogs and magazine writing tend to present food as conservative, traditional, and overly sweet. We will explore techniques to make your own individuality heard in its grumpy, queer, unsavory, messy, aged, or just plain weird glory. We’ll seek to strengthen your critical voice, define your own taste, and attract audiences with more diverse lives or particular interests, all the while taking inspiration from unconventional food writers who broke the mold. Please bring a piece you’re working on or ideas for a story. 2) “Narrating Racial [In]Justice Through Critical Food Writing,” taught by Dr. Breeze Harper. Breeze Harper edited the anthology Sistah Vegan: Black Female Vegans Speak On Food, Identity, Health, and Society and is the author of the social justice novel Scars: A Black Lesbian Experience in Rural White New England (2014). Her blog is The Sistah Vegan Project. Workshop Description: In this workshop, participants will use food writing to explore their own personal experiences with racial injustice as well as anti-racism activism. The workshop is an outlet for those who love critical food writing/reading and have experienced the frustration and pain of being survivors of racism and/or are anti-racist activists. 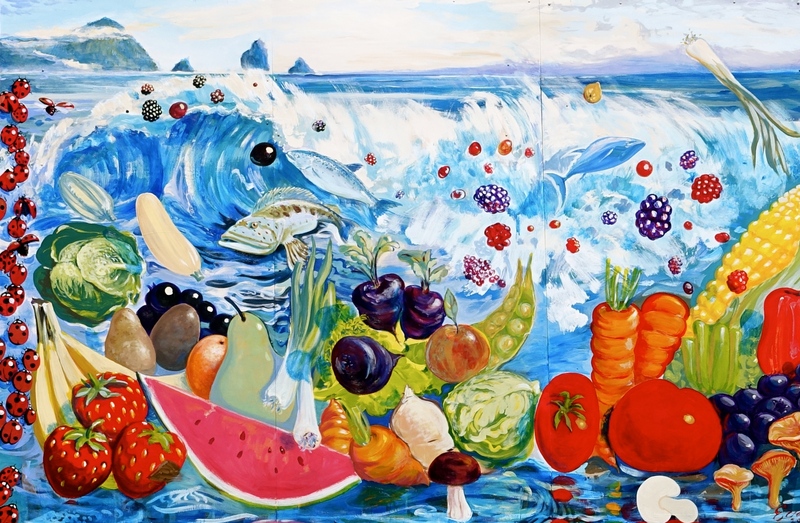 Image is a mural outside the Port Orford Co-op. A supermarket in Oregon. I love this artist’s unique imagination. I smile every single time I see it. Leeks in the waves! Watermelons washing ashore! What peaches and what penumbras! This is the book of the generations of sourdough starter. Well, blog post, anyway. As described earlier, our Bread 101 class is making sourdough as a lab project. If you’re interested in participating or following along, we are making baker Chad Robertson’s rather complex and detailed starter recipe from his book Tartine Book No. 3. My fellow instructors Elly and Karen are blogging their experiences, too, so check out Elly’s detailed daily blog entries and recipes at We’re Out of Eggs, I’ll Use Asparagus and Karen’s blog musings on fermentation and local cooking at Fairmount Neighborhood Farmers Market. The upper right image is my initial starter made with 50/50 Open Oak Farm ‘Maris Widgeon’ wheat and King Arthur unbleached white flour. Maris Widgeon is a bread flour that is grown in the Willamette Valley by the Open Oak/Adaptive Seeds family, but was developed 50 years ago for roof thatching in Europe. The starter is almost unhappily tart with lactobacilli, the same beasties that create the sour in sauerkraut and yogurt. With the almost constant fermentation I do, my kitchen is full of them. 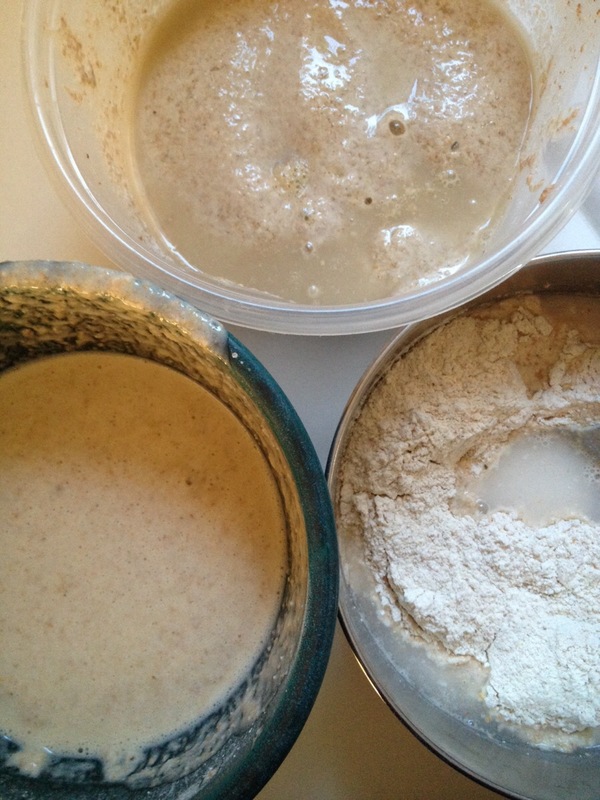 The image on the upper left is the result of feeding a piece of the initial starter with more flour and water and letting it sit for another day to beget starter 2.0. 24 hours later, nearly godlike, I took a piece of starter 2.0 and fed it with more flour and water to beget starter 3.0. The bottom image is starter 3.0, forming nice bubbles and smelling much more yeasty and pleasant rather than lactic. 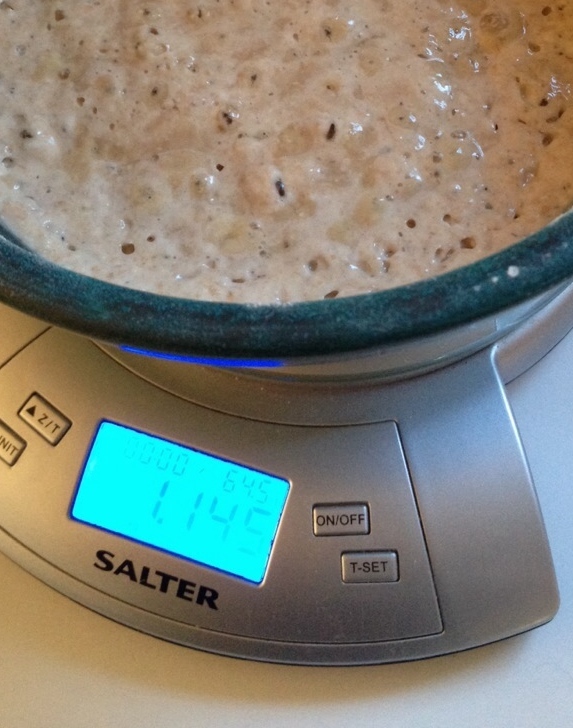 All of us on the teaching team had the same reticence about the waste that goes into creating this sourdough starter. The general idea is to ferment a couple cups of a flour-water paste, then pour off a small amount (75 grams, if you must know) then feed that little piece (250 grams of water and flour, if you must know) for 24 hours, then start again, repeating for several days. Some of us reduced the initial inputs. Others (like me!) made sourdough pancakes with the leftover fermented batter. And they weren’t bad! 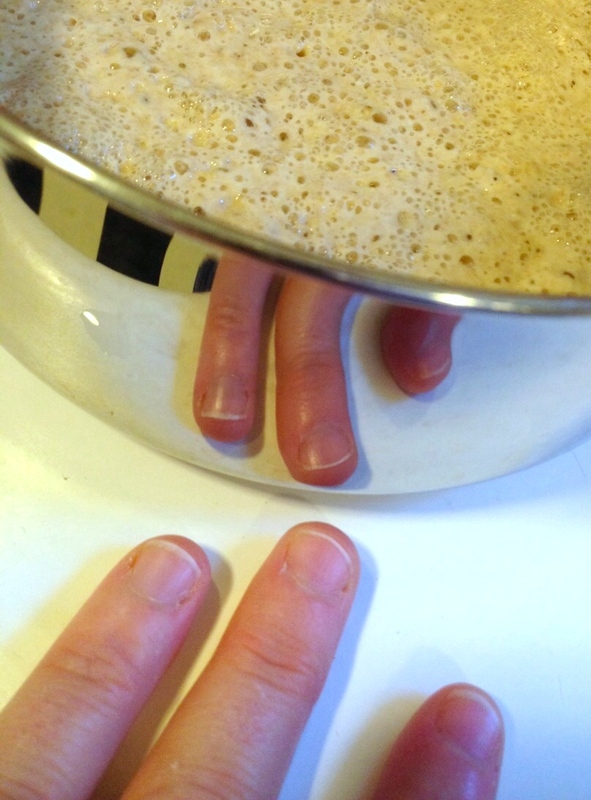 Be sure to check out Elly’s recipe and process for sourdough pancakes, which differs from mine. For more on the fermentation process, see Karen’s entry on her starter. EDITED TO ADD: After a week or so of feeding, the starter has calmed down and is smelling more yeasty now, nice and gently sour, more bready than sauerkrauty. Collateral damage, though, perhaps: did the yeasts affect my latest batch of crème fraîche, souring next to the sourdough? It failed to set up and grew mold on top almost immediately. It’s always a wild ride with fermentation! Combine starter, egg, syrup, oil, and baking soda. Use some milk to thin the batter to a pancake batter consistency OR add some cornmeal or flour if the batter seems too thin. You will need to use your judgment and your own pancake tastes – some like them thicker and fluffier than others. I ended up using both milk and cornmeal to find a perfect balance between batches. Let the batter sit on the counter for 10-15 minutes to allow baking soda to do its magic. Heat nonstick skillet or griddle to medium heat. Add butter or coconut oil, coating pan as it melts, then pour 3-4-inch diameter rounds of batter for each pancake. Prepare in batches, cooking pancakes until the surface is well bubbled and mostly dry on top, then flip over and cook for a few minutes more. You are looking for golden brown surfaces on both sides. The pan is too hot if it burns unevenly, and too cool if the pancake just soaks up the butter and doesn’t brown. Serve with maple syrup. You may freeze leftover cooked pancakes on a cookie sheet, IQF (individually-quick-frozen) style, then pop them off the sheet and store in freezer bags for a quick breakfast. Am I souring on traditional discipline-focused college curricula? No, but this spring I *am* teaching a tremendously fun course through COLT on literature, food and society (as discussed here), and I’m also part of an innovative team-taught course that partners the Natural Sciences with the Humanities, all in the name of a loaf of bread. Yes, University of Oregon HC441: “Bread 101” investigates the science and culture of bread! The course is unusual not only because it’s deeply local and geared to increase burgeoning interest in a Food Studies program at UO, but also because of its innovative curriculum that uses Humanities-based lines of inquiry and writing assignments to augment science literacy. Many Food Studies classes are taught from a Social Science or Nutrition perspective by a single instructor, so we felt the course could model new approaches for systemic collaboration across the Sci/Hum divide and offer value to this emerging discipline. The course is being taught by Judith Eisen (Biology, Institute of Neuroscience, and Director of the Science Literacy Program), Elly Vandegrift (Biology and Associate Director of the SLP), Karen Guillemin (Biology and Director of the Microbial Ecology and Theory of Animals Center for Systems Biology), Miriam Deutsch (Physics and Oregon Center for Optics), and yours truly, Jennifer Burns Bright (Comparative Literature and English). Bread is a complex medium, looking nothing like the original seed of grain from which it originates. Yet when we mix a few simple ingredients we are able to induce a transformation that results in an edible, highly nourishing, staple food product crucial for sustenance in many cultures. In “Bread 101”, students will explore with a team of faculty from the sciences and humanities the energy requirements, biomedical and biochemical aspects, and local and sociopolitical context of bread production. Students will read and discuss a variety of primary and secondary literature related to wheat production, the microbiological, chemical, and physical processes that transform wheat into bread, the energy cost of this transformation, and cultural implications of bread production. There will be several field trips and guest speakers. 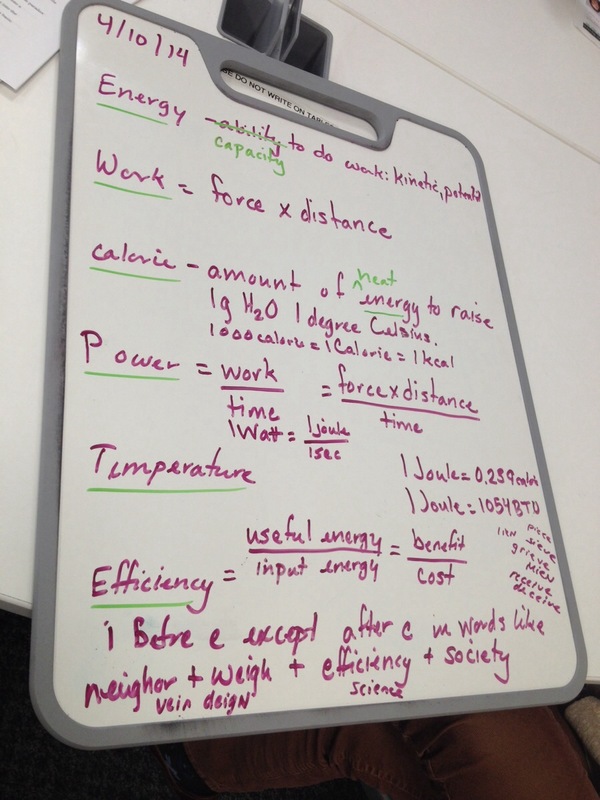 Course work will include active discussions, short essays, problem sets, and a presentation. 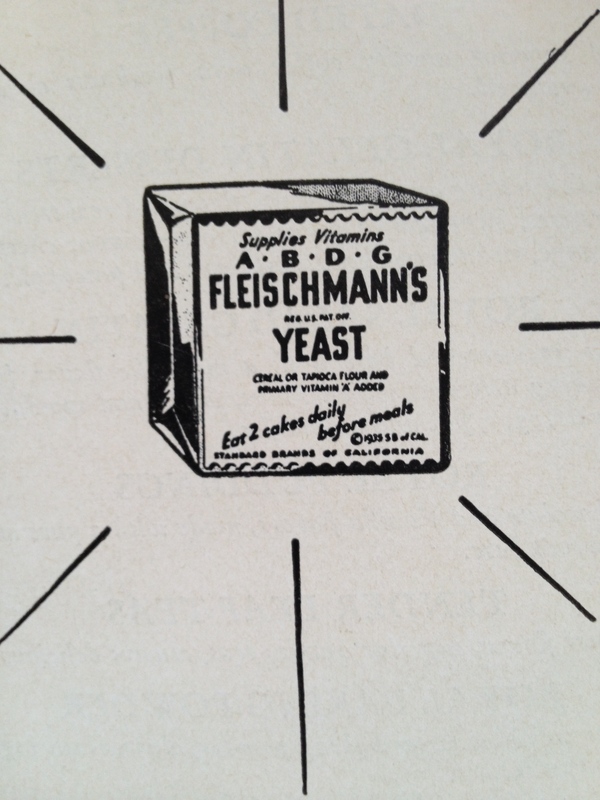 Photos: My sourdough starter in progress, local grain display at Camas Country Mill, white board exercises on energetics and photosynthesis (with guest Nick Routledge), and a 1937 advertisement for Fleischmann’s yeast cakes (eat two a day for optimal health!). It’s Spring, and you know it, another term! I’m teaching a larger version of my Food Studies introduction at University of Oregon, and could use your help spreading the news. If you know any current UO student who’s enchanted by Charlie and the Chocolate Factory, wants to know How to Cook a Wolf, and can negotiate The Jungle with no fear, we’ll be reading all that and more, studying the fiction beside articles on contemporary issues in the best food and culture reader on the market. It’s a Gen Ed/IC offering, so consider your requirement needs pwnd. Standard tuition fees apply, must be enrolled at UO. Course is about half full, so sign up soon! Course introduction video is here, produced by Jennifer Simon for the COLT Department. 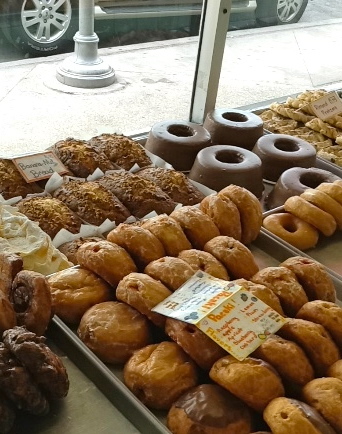 Happy Paczki Day 2014! Honestly, I don’t think I can say it any better than I did last year, in my prayer for Fat Tuesday, so I won’t. I owe you a serious update. There’s a lot going on. But with my main laptop in the shop for at least a week with almost all my data, a half-working backup laptop that turns off when it decides it is tired of working, and a loaner from school — all in Week 9 — I’m a little scattered. But in case you’re curious in the interim: I’ve been off milking goats at a farm stay; I’m co-curating a Special Collections exhibit on the past 500 years or so of science in the kitchen using rare books at the Knight Library; I just gave a keynote talk on 100 years of science in food to 450 captive souls at Pleasant Hill High School; I’m teaching two great food studies classes next term open to all UO students (see the teaser video for COLT 231 here); and I now have more egg recipes than a chicken.